As my husband and I work to achieve our quest of visiting all 59 national parks in the U.S., we often batch our visits, taking several days off to visit parks that are somewhat close to one another in the same trip. We visited Lassen Volcanic National Park, in northern California, after spending time at Crater Lake and Redwood national parks a few years ago. Named after Lassen Peak, one of the largest plug dome volcanoes, the park offers a variety of adventures and includes the four types of volcanoes found in the world. The main park road provides great views and access to popular trails, and there are more than 150 miles of trails to choose from. We visited Lassen late September, greeted by snowy roads, thunder and intermittent rain that paused long enough for us to set up camp and view Devastated Area, a half-mile, easy and accessible hike with information about the eruptions of 1914-17. After camping in sub-freezing temperatures at the Manzanita Lake campground, I was slow to get out of my warm cocoon of a sleeping bag the next morning! But we had much to explore. As I’ve blogged about before, when hanging out with Mother Nature, things don’t always go as anticipated. But sometimes, that makes the moments even more special. We decided to hike Lassen Peak—we had to do the park’s namesake!—hoping the sun would overcome the clouds and we’d get some amazing panoramic views at the top. It was cold and windy, and the trail was snowy and slick in a few spots, which made the trek intense and interesting (and allowed for a few snowball fights along the way). The trail gains 2,000 feet of elevation as you hike the 2.5 miles to the summit. We reached the summit and saw… this. But after reaching the summit and making our way back down the trail… this happened. While we didn’t see anything on the way up or at the top (besides the trail in front of us), seeing the clouds roll away and unveil a dramatic sight on the way back down made for a pretty special experience. After our hike, the Lake Helen picnic area offered a great place to refuel and relax while taking in views of Lassen Peak and the sapphire water of the lake. If you’re interested in seeing geothermal areas without the massive crowds of Yellowstone, check out Lassen Volcanic. Here are a couple places we explored. 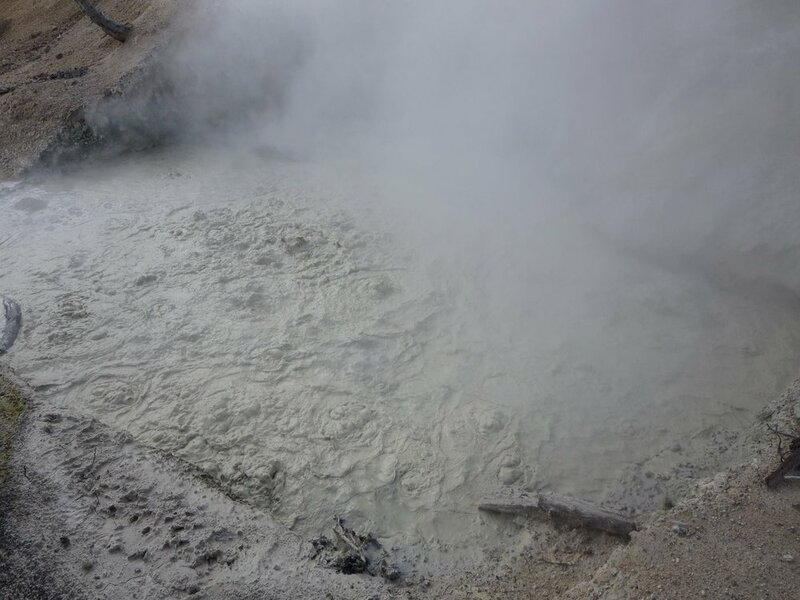 Visiting the Sulphur Works area gives you easy access to an active hydrothermal area, like this big, boiling, bubbling clay mud pot right off the side of the road! As an ‘80s child who loved the movie Labyrinth (and swooned over David Bowie and his epic mullet), going through the hydrothermal areas in Lassen brought back flashbacks of The Bog of Eternal Stench scene. There is even a feature called Fart Gulch in the park! As the Labyrinth story goes, “if you so much as set a foot in the Bog of Stench, you'll smell bad for the rest of your life.” But if you go to Lassen Volcanic National Park, the memories are what stick with you. Have you been to Lassen Volcanic? Any stories you want to share? Comment below! Sign up for our emails to get all of our latest blogs, events, and contests plus be auto entered for a free quarterly print drawing!